God bless the Cleveland Browns, they still always seem to find a way, don’t they? 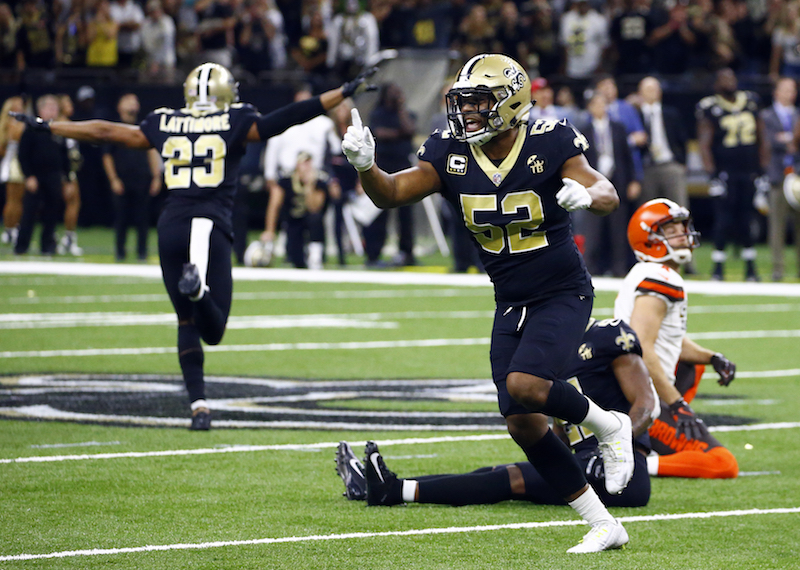 Their latest performance in a 19-game winless streak was almost good enough to knock off the New Orleans Saints but in the end, thanks to an inept kicker, the Browns left the Big Easy with a 21-18 loss and the Saints got to count their lucky stars. This is one of those games the Saints should just chalk up to experience and immediately forget about but lets take another look, shall we? Yes, it was that bad. The Saints were one horrific kicking performance away, by the Browns’ Zane Gonzalez, from watching their season seriously take a hit from which it might not recover. Sure, the Saints have started every season 0-2 since 2014 but the mojo coming off a loss to the Browns would be hard to overcome. Worse still, with a loss, the team would have moved forward without an identity whatsoever. Are there problems with the offense? Maybe. After putting up 40 points in Week One against the Tampa Bay Buccaneers the offense was mired in mistakes against the Browns. Penalties killed drives, the running game is still not clicking and even Drew Brees was missing easy throws. So, can the Saints rely on the defense? You tell me. In Week One, they gave up 48 points and followed that performance with a performance that was better but by no means exemplary. Teams are still not afraid to throw at Marshon Lattimore, the pass rush never shook up Browns’ quarterback Tyrod Taylor and someone still needs to explain to me how Ken Crawley gets burnt by a rookie receiver for a 47-yard touchdown with less than 90 seconds to go in what should have been the game winner for the Browns. Yet, again, thankfully the Browns are the Browns. I assure you the Atlanta Falcons won’t do the same. At the beginning of the season when we were all busy rationalizing a 9-1 start for the Saints, I had the upcoming games versus the New York football Giants, Washington Redskins and Baltimore Ravens chalked up as wins. All of that is suspect at this point. It’s all suspect because who knows what this team can or cannot do? Yes, I am hammering on them a bit and I do have to give the Saints props for scoring 18 points in the fourth quarter to take their first win of the year. Heck, I would even say the win was energizing and a testament to this teams’ badassery but… it just wasn’t. The Saints got lucky on Sunday. It was a game that screamed loss but the team muddled its way through to a win. This team is obviously missing Mark Ingram as Alvin Kamara isn’t a bellweather-type back like Ingram and backup Mike Gillislee isn’t getting the job done either but its bigger than that. Hopefully the Saints can get it figured out, quickly. Mike Thomas has been absolutely All-World the first two weeks catching 28 balls for 289 yards and three touchdowns. But even Thomas has coughed up two fumbles so far. Also, while Brees will undoubtedly have a statue in Champions Square at some point in the future his statuesque performance in the pocket versus the Browns is worrisome. If you looked around the league at the Saints divisional opponents on Sunday, those teams were in big-time battles. The Falcons, who the Saints play this week, knocked off the Carolina Panthers 31-24 in a game that saw the Falcons run at will against the Panthers and watched the Falcons offense go a perfect four-for-four in the red zone. On the other side of the ball, the Panthers Cam Newton is still putting up video game numbers and almost pulled off a major win on the road. In Tampa Bay, the Buccaneers, behind another stellar performance by Ryan Fitzpatrick, knocked off the defending Super Bowl Champions, the Philadelphia Eagles, 27-21 in a performance that has that city talking division title. Are you talking division title this week about the Saints? Out of these three games, two of them looked like big time football and the other looked like junior varsity. I’ll let you decide which is which. On the other hand, a win is a win and its good to have the first one under the belt. The NFL is a 16-game slugfest and towards the end of the season it doesn’t matter how you got the wins just as long as you have enough to put you in the playoff hunt. Brees and crew will undoubtedly learn from this game and make another run for the playoffs. It’s just going to be a nasty path to get there. But, as always, you only play one game at a time and if the Saints can get to their bye week (after Week Five) sitting 3-2 or better then the fun begins. So, you should put it behind you too, New Orleans. It’s Atlanta Week! Now get to those message boards and make fun of your favorite Falcons fan. Who Dat! Playlist Recommendation: *Not a song but check out Browns fans kicking field goals in the French Quarter! As the Saints took their first step towards respectability with a win, their cohorts in Uptown took a major step backwards in that department as the Tulane Green Wave lost 31-24 to the University of Alabama-Birmingham. It’s a loss that could cripple the team’s post-season hopes and could have been avoided if the team didn’t take the entire first half off against the Blazers. Jonathan Banks had a wildly forgettable performance in the first half (1-for-8, 44 yards, 1 INT) and the defense got lucky to only trail 21-7 at halftime. It was bad all around and even though the offense finally started making plays in the second half and mounted a furious comeback it was all for naught as the Blazers held on for victory. Now the Tulane Green Wave get to travel to Columbus to take on the Ohio State Buckeyes at 2:30 p.m. on Saturday. Ouch.